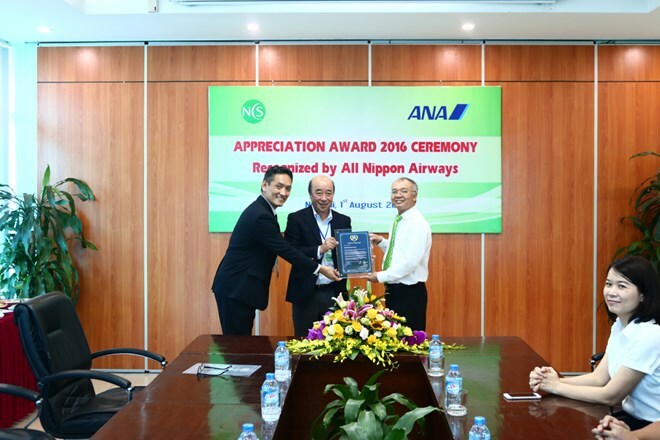 Hanoi (VNA) – The Noi Bai Catering Services Joint Stock Company (NCS), a subsidiary of the Vietnam Airlines Corporation, has received a “Certificate of Appreciation” from Japan’s All Nippon Airways (ANA) for its excellent in-flight meals offered on the ANA’s flights. The NCS ranks second among more than 40 caterers worldwide providing services for the Japanese airline. It qualified all stringent criteria set by the ANA, a five-star airline in accordance to SkyTrak standards, including food safety to provide hygienic in-flight meals, taste of the meals, safe and punctual aircraft loading and unloading of service items. The result was based on an annual hygiene checkup held by ANA’s inspection group and Medina, an independent international evaluation organisation. Along with the ANA, the NSC is currently providing around 22,000 in-flight meals per day for over 25 domestic and foreign airlines.